Important paper by the lead researcher of the largest hospital-based NDE study about the implications of near-death experiences on theories of continuity of consciousness. In this paper van Lommel discusses some more general aspects of death, followed by more details from his prospective study on near-death experience in survivors of cardiac arrest in the Netherlands, which was published in the Lancet. He also comments on similar findings from two prospective studies in survivors of cardiac arrest from the USA and from the United Kingdom. Finally, he discusses implications for consciousness studies, and how it could be possible to explain the continuity of our consciousness. Cardiologist, Division of Cardiology, Hospital Rijnstate, PO Box 9555, 6800 TA Arnhem, The Netherlands. Some people who have survived a life-threatening crisis report an extraordinary experience. Near-death experiences (NDE) occur with increasing frequency because of improved survival rates resulting from modern techniques of resuscitation. The content of NDE and the effects on patients seem similar worldwide, across all cultures and times. The subjective nature and absence of a frame of reference for this experience lead to individual, cultural, and religious factors determining the vocabulary used to describe and interpret the experience. NDE can be defined as the reported memory of the whole of impressions during a special state of consciousness, including a number of special elements such as out-of-body experience, pleasant feelings, seeing a tunnel, a light, deceased relatives, or a life review. Many circumstances are described during which NDE are reported, such as cardiac arrest (clinical death), shock after loss of blood, traumatic brain injury or intra-cerebral haemorrhage, near-drowning or asphyxia, but also in serious diseases not immediately life-threatening. Similar experiences to near-death ones can occur during the terminal phase of illness, and are called deathbed visions. Furthermore, identical experiences, so-called “fear-death” experiences, are mainly reported after situations in which death seemed unavoidable like serious traffic or mountaineering accidents. The NDE is transformational, causing profound changes of life-insight and loss of the fear of death. An NDE seems to be a relatively regularly occurring, and to many physicians an inexplicable phenomenon and hence an ignored result of survival in a critical medical situation. And should we also consider the possibility of conscious experience when someone in coma has been declared brain dead by physicians, and organ transplantation is about to be started? Recently several books were published in the Netherlands about what patients had experienced in their consciousness during coma following a severe traffic accident, following acute disseminated encephalomyelitis (ADEM), or following complications with cerebral hypertension after surgery for a brain tumour, this last patient being declared brain dead by his neurologist and neurosurgeon, but the family refused to give permission for organ donation. All these patients reported, after regaining consciousness, that they had experienced clear consciousness with memories, emotions, and perception out of and above their body during the period of their coma, also “seeing” nurses, physicians and family in and around the ICU. Does brain death really means death, or is it just the beginning of the process of dying that can last for hours to days, and what happens to consciousness during this period? Should we also consider the possibility that someone who is clinically dead during cardiac arrest can experience consciousness, and even whether there could still be consciousness after someone really has died, when his body is cold? How is consciousness related to the integrity of brain function? Is it possible to gain insight in thisrelationship? In my view the only possible empirical approach to evaluate theories about consciousness is research on NDE, because in studying the several universal elements that are reported during NDE, we get the opportunity to verify all the existing theories about consciousness that have been discussed until now. Consciousness presents temporal as well as everlasting experiences. Is there a start or an end to consciousness? In this paper I first will discuss some more general aspects of death, and after that I will describe more details from our prospective study on near-death experience in survivors of cardiac arrest in the Netherlands, which was published in the Lancet.1 I also want to comment on similar findings from two prospective studies in survivors of cardiac arrest from the USA2 and from the United Kingdom.3 Finally, I will discuss implications for consciousness studies, and how it could be possible to explain the continuity of our consciousness. Originally published in: Brain Death and Disorders of Consciousness. Machado, C. and Shewmon, D.A., Eds. New York, Boston, Dordrecht, London, Moscow: Kluwer Academic/ Plenum Publishers, Advances in Experimental Medicine and Biology Adv Exp Med Biol. 2004; 550: 115-132. First I want to discuss death. The confrontation with death raises many basic questions, also for physicians. Why are we afraid of death? Are our concepts about death correct? Most of us believethat death is the end of our existence; we believe that it is the end of everything we are. We believe that the death of our body is the end of our identity, the end of our thoughts and memories, that it is the end of our consciousness. Do we have to change our concepts about death, not only based on what has been thought and written about death in human history around the world in many cultures, in many religions, and in all times, but also based on insights from recent scientific research on NDE? What happens when I am dead? What is death? During our life 500000 cells die each second, each day about 50 billion cells in our body are replaced, resulting in a new body each year. So cell death is totally different from body death when you eventually die. During our life our body changes continuously, each day, each minute, each second. Each year about 98% of our molecules and atoms in our body have been replaced. Each living being is in an unstable balance of two opposing processes of continual disintegration and integration. But no one realizes this constant change. And from where comes the continuity of our continually changing body? Cells are just the building blocks of our body, like the bricks of a house, but who is the architect, who coordinates the building of this house. When someone has died, only mortal remains are left: only matter. But where is the director of the body?What about our consciousness when we die? Is someone his body, or do we “have” a body? In 1969 during my rotating internship a patient was successfully resuscitated in the cardiac ward by electrical defibrillation. The patient regained consciousness, and was very, very disappointed. He told me about a tunnel, beautiful colours, a light and beautiful music. I have never forgotten this event, but I did not do anything with it. Years later, in 1976 Raymond Moody first described the so-called “near-death experiences”, and only in 1986 I read about these experiences in the book by George Ritchieentitled “Return from Tomorrow,” which relates what he experienced during a period of clinical death of 6-minutes duration in 1943 during his medical study.4 After reading his book I started to interview my patients who had survived a cardiac arrest. To my great surprise, within two years about fifty patients told me about their NDE. My scientific curiosity started to grow, because according to our current medical concepts, it is not possible to experience consciousness during a cardiac arrest, when circulation and breathing have ceased. Several theories on the origin of an NDE have been proposed. Some think the experience is caused by physiological changes in the brain such as brain cells dying as a result of cerebral anoxia, and possibly also caused by release of endorphins, or NMDA receptor blockade.5 Other theories encompass a psychological reaction to approaching death6 or a combination of such reaction and anoxia.7 But until now there was no prospective, meticulous and scientifically designed study to explain the cause and content of an NDE. All studies had been retrospective and very selective with respect to patients. In retrospective studies 5-30 years can elapse between occurrence of the experience and its investigation, which often prevents accurate assessment of medical and pharmacological factors. We wanted to know if there could be a physiological, pharmacological, psychological or demographic explanation why people experience consciousness during a period of clinical death. The definition of clinical death was used for the period of unconsciousness caused by anoxia of the brain due to the arrest of circulation and breathing that happens during ventricular fibrillation in patients with acute myocardial infarction. We studied patients who survived cardiac arrest, because this is a well-described life threatening medical situation, where patients will ultimately die from irreversible damage to the brain if cardio-pulmonary resuscitation (CPR) is not initiated within 5 to 10 minutes. It is the closest model of the process of dying. So, in 1988 we started a prospective study of 344 consecutive survivors of cardiac arrest in ten Dutch hospitals with the aim of investigating the frequency, the cause and the content of an NDE.1 We did a short standardised interview with sufficiently recovered patients within a few days of resuscitation, and asked whether they could remember the period of unconsciousness, and what they recalled. In cases where memories were reported, we coded the experiences according to a weighted core experience index. In this system the depth of the NDE was measured according to the reported elements of the content of the NDE. The more elements were reported, the deeper the experience was and the higher the resulting score was. Results: 62 patients (18%) reported some recollection of the time of clinical death. Of these patients 41 (12%) had a core experience with a score of 6 or higher, and 21 (6%) had a superficial NDE. In the core group 23 patients (7%) reported a deep or very deep experience with a score of 10 or higher. And 282 patients (82%) had no recollection of the period of cardiac arrest. In our study about 50% of the patients with an NDE reported awareness of being dead, or had positive emotions, 30% reported moving through a tunnel, had an observation of a celestial landscape, or had a meeting with deceased relatives. About 25% of the patients with an NDE had an out-of-body experience, had communication with “the light,” or observed colours, 13% experienced a life review, and 8% experienced a border. What might distinguish the small percentage of patients who report an NDE from those who do not? We found that neither the duration of cardiac arrest nor the duration of unconsciousness, nor the need for intubation in complicated CPR, nor induced cardiac arrest in electrophysiological stimulation (EPS) had any influence on the frequency of NDE. Neither could we find any relationship between the frequency of NDE and administered drugs, fear of death before the arrest, foreknowledge of NDE, religion or education. An NDE was more frequently reported at ages lower than 60 years, and also by patients who had had more than one CPR during their hospital stay, and by patients who had experienced an NDE previously. Patients with memory defects induced by lengthy CPR reported an NDE less frequently. Good short-term memory seems to be essential for remembering an NDE. Unexpectedly, we found that significantly more patients who had an NDE, especially a deep experience, died within 30 days of CPR (p<0.0001). 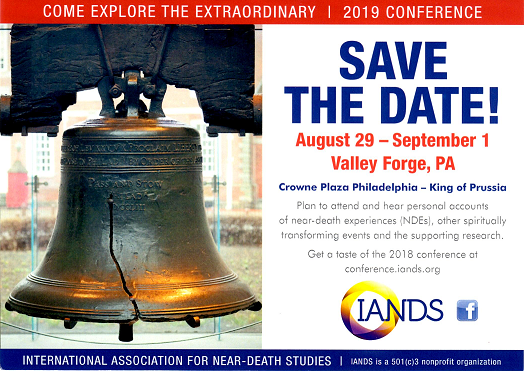 We performed a longitudinal study with taped interviews of all late survivors with NDE 2 and 8 years following the cardiac arrest, along with a matched control group of survivors of cardiac arrest who did not report an NDE.1 This study was designed to assess whether the transformation in attitude toward life and death following an NDE is the result of having an NDE or the result of the cardiac arrest itself. In this follow-up research into transformational processes after NDE, we found a significant difference between patients with and without an NDE. The process of transformation took several years to consolidate. Patients with an NDE did not show any fear of death, they strongly believed in an afterlife, and their insight in what is important in life had changed: love and compassion for oneself, for others, and for nature. They now understood the cosmic law that everything one does to others will ultimately be returned to oneself: hatred and violence as well as love and compassion. Remarkably, there was often evidence of increased intuitive feelings. Furthermore, the long lasting transformational effects of an experience that lasts only a few minutes was a surprising and unexpected finding. Several theories have been proposed to explain NDE. However, in our prospective study we did not show that psychological, physiological or pharmacological factors caused these experiences after cardiac arrest. With a purely physiological explanation such as cerebral anoxia, most patients who had been clinically dead should report an NDE. All 344 patients had been unconscious because of anoxia of the brain resulting from their cardiac arrest. Why should only 18% of the survivors of cardiac arrest report an NDE? And yet, neurophysiological processes must play some part in NDE, because NDE-like experiences can be induced through electrical “stimulation” of some parts of the cortex in patients with epilepsy,8 with high carbon dioxide levels (hypercarbia)9 and in decreased cerebral perfusion resulting in local cerebral hypoxia, as in rapid acceleration during training of fighter pilots,10 or as in hyperventilation followed by Valsalva maneuver.11 Also NDE-like experiences have been reported after the use of drugs like ketamine,12 LSD,13 or mushrooms.14 These induced experiences can sometimes result in a period of unconsciousness, but can at the same time also consist of out-of-body experiences, perception of sound, light or flashes of recollections from the past. These recollections, however, consist of fragmented and random memories unlike the panoramic life-review that can occur in NDE. Further, transformational processes are rarely reported after induced experiences. Thus, induced experiences are not identical to NDE. Another theory holds that NDE might be a changing state of consciousness (transcendence, or the theory of continuity), in which memories, identity, and cognition, with emotion, function independently from the unconscious body, and retain the possibility of non-sensory perception. Obviously, consciousness during NDE was experienced independently from the normal body-linked waking consciousness. With lack of evidence for any other theories for NDE, the concept thus far assumed but never scientifically proven, that consciousness and memories are localized in the brain should be discussed. Traditionally, it has been argued that thoughts or consciousness are produced by large groups of neurons or neuronal networks. How could a clear consciousness outside one’s body be experienced at the moment that the brain no longer functions during a period of clinical death, with flat EEG?15 Furthermore, blind people have also described veridical perceptions during out-of-body experiences at the time of their NDE.16 Scientific study of NDE pushes us to the limits of our medical and neurophysiological ideas about the range of human consciousness and relationship of consciousness and memories to the brain. Also Greyson2 writes in his discussion: “No one physiological or psychological model by itself explains all the common features of NDE. The paradoxical occurrence of heightened, lucid awareness and logical thought processes during a period of impaired cerebral perfusion raises particular perplexing questions for our current understanding of consciousness and its relation to brain function. A clear sensorium and complex perceptual processes during a period of apparent clinical death challenge the concept that consciousness is localized exclusively in the brain.” And Parnia and Fenwick3 write in their discussion: “The data suggest that the NDE arises during unconsciousness. This is a surprising conclusion, because when the brain is so dysfunctional that the patient is deeply comatose, the cerebral structures, which underpin subjective experience and memory, must be severely impaired. Complex experiences such as are reported in the NDE should not arise or be retained in memory. Such patients would be expected to have no subjective experience [as was the case in the vast majority of patients who survive cardiac arrest in the three published prospective studies1-3 or at best a confusional state if some brain function is retained. Even if the unconscious brain is flooded by neurotransmitters this should not produce clear, lucid remembered experiences, as those cerebral modules, which generate conscious experience, are impaired by cerebral anoxia. The fact that in a cardiac arrest loss of cortical function precedes the rapid loss of brainstem activity lends further support to this view. An alternative explanation would be that the observed experiences arise during the loss of, or on regaining consciousness. The transition from consciousness to unconsciousness is rapid, with the EEG showing changes within a few seconds, and appearing immediate to the subject. Experiences which occur during the recovery of consciousness are confusional, which these were not”. In fact, memory is a very sensitive indicator of brain injury and the length of amnesia before and after unconsciousness is an indicator of the severity of the injury. Therefore, events that occur just prior to or just after loss of consciousness would not be expected to be recalled. And as stated before, in our study1 patients with loss of memory induced by lengthy CPR reported significantly fewer NDE. Good short-term memory seems to be essential for remembering NDE. Before I discuss in greater detail some neurophysiological aspects of brain functioning during cardiac arrest, I would like to reconsider certain elements of the NDE, like the out-of-body experience, the holographic life review and preview, the encounter with deceased relatives, the return into the body and the disappearance of the fear of death. Following an NDE people know of the continuity of their consciousness, retaining all thoughts and past events. And this insight causes exactly their process of transformation and the loss of fear of death. Man appears to be more than just a body. All these elements of an NDE were experienced during the period of cardiac arrest, during the period of apparent unconsciousness, during the period of clinical death! But how is it possible to explain these experiences during the period of temporary loss of all functions of the brain due to acute pancerebral ischemia? We know that patients with cardiac arrest are unconscious within seconds. But how do we know that the electroencephalogram (EEG) is flat in those patients, and how can we study this? Complete cessation of cerebral circulation is found in cardiac arrest due to ventricular fibrillation (VF) during threshold testing at implantation of internal defibrillators. This complete cerebral ischemic model can be used to study the result of anoxia of the brain. After defibrillation the Vmca, measured by transcranial Doppler technique, returns rapidly within 1-5 seconds after a cardiac arrest of short duration. However, in the case of a prolonged cardiac arrest of more than 37 seconds, the Vmca shows an initial overshoot upon reperfusion, a transient global hyperaemia, followed by a significant decrease in cerebral blood flow up to 50% or less of normal.22 This results also in an initial overshoot of cerebral oxygen uptake (hyperoxia) with a fast decrease in cerebral oxygen uptake to borderline values for a considerable time due to delayed hypoperfusion.18,22 In the case of a prolonged cardiac arrest the EEG recovery also takes more time, and normal EEG activity may not return for many minutes to hours after cardiac function has been restored, depending on the duration of the cardiac arrest, despite maintenance of adequate blood pressure during the recovery phase. Additionally, EEG recovery underestimates the metabolic recovery of the brain, and cerebral oxygen uptake may be depressed for a considerable time after restoration of circulation.18 In acute myocardial infarction the duration of cardiac arrest (VF) in the Coronary Care Unit (CCU) is usually 60-120 seconds, on the cardiac ward 2-5 minutes, and in out-of-hospital arrest it usually exceeds 5-10 minutes. Only during threshold testing of internal defibrillators or during electrophysiological stimulation studies will the duration of cardiac arrest rarely exceed 30-60 seconds. Anoxia causes loss of function of our cell systems. However, in anoxia of only some minute’s duration this loss may be transient; in prolonged anoxia cell death occurs, with permanent functional loss. During an embolic event a small clot obstructs the blood flow in a small vessel of the cortex, resulting in anoxia of that part of the brain, with loss of electrical activity. This results in a functional loss of the cortex like hemiplegia or aphasia. When the clot is dissolved or broken down within several minutes the lost cortical function is restored. This is called a transient ischemic attack (TIA). However, when the clot obstructs the cerebral vessel for minutes to hours, it will result in neuronal cell death, with a permanent loss of function of this part of the brain, with persistent hemiplegia or aphasia, and the diagnosis of cerebrovascular accident (CVA) is made. So transient anoxia results in transient loss of function. In cardiac arrest global anoxia of the brain occurs within seconds. Timely and adequate CPR reverses this functional loss of the brain, because definitive damage of the brain cells, resulting in cell death, has been prevented. Long lasting anoxia, caused by cessation of blood flow to the brain for more than 5-10 minutes, results in irreversible damage and extensive cell death in the brain. This is called brain death, and most patients will ultimately die. So we have to conclude that NDE in our study,1 as well as in the American2 and the British study,3 was experienced during a transient functional loss of all functions of the cortex and of the brainstem. How could a clear consciousness outside one’s body be experienced at the moment that the brain no longer functions during a period of clinical death, with a flat EEG? Such a brain would be roughly analogous to a computer with its power source unplugged and its circuits detached. It couldn’t hallucinate; it couldn’t do anything at all. As stated before, up to the present it has generally been assumed that consciousness and memories are localized inside the brain, that the brain produces them. According to this unproven concept, consciousness and memories ought to vanish with physical death, and necessary also during clinical death or brain death. However, during an NDE patients experience the continuity of their consciousness with the possibility of perception outside and above one’s lifeless body. Consciousness can be experienced in another dimension without our conventional body-linked concept of time and space, where all past, present and future events exist and can be observed simultaneously and instantaneously (non-locality). In the other dimension, one can be connected with the personal memories and fields of consciousness of oneself as well as others, including deceased relatives (universal interconnectedness). And the conscious return into one’s body can be experienced, together with the feeling of bodily limitation, and also sometimes the awareness of the loss of universal wisdom and love they had experienced during their NDE. Interrupting the electrical fields of local neuronal networks in parts of the cortex also disturbs the normal functioning of the brain. By localized electrical stimulation of the temporal and parietal lobe during surgery for epilepsy the neurosurgeon and Nobel prize winner Wilder Penfield could sometimes induce flashes of recollection of the past (never a complete life review), experiences of light, sound or music, and rarely a kind of out-of-body experience (OBE).33,34 These experiences did not produce any life-attitude transformation. Some researchers try to create artificial intelligence by computer technology, hoping to simulate programs evoking consciousness. But Roger Penrose, a quantum physicist, argues that “Algorithmic computations cannot simulate mathematical reasoning. The brain, as a closed system capable of internal and consistent computations, is insufficient to elicit human consciousness.”36 Penrose offers a quantum mechanical hypothesis to explain the relation between consciousness and the brain. And Simon Berkovitch, a professor in Computer Science of the George Washington University, has calculated that the brain has an absolutely inadequate capacity to produce and store all the informational processes of all our memories with associative thoughts. We would need 1024 operations per second, which is absolutely impossible for our neurons.37 Herms Romijn, a Dutch neurobiologist, comes to the same conclusion.30 One should conclude that the brain has not enough computing capacity to store all the memories with associative thoughts from one’s life, has not enough retrieval abilities, and seems not to be able to elicit consciousness. With our current medical and scientific concepts it seems impossible to explain all aspects of the subjective experiences as reported by patients with an NDE during their period of cardiac arrest, during a transient loss of all functions of the brain. But science, I believe, is the search for explaining new mysteries rather than the cataloguing of old facts and concepts. So it is a scientific challenge to discuss new hypotheses that could explain the reported interconnectedness with the consciousness of other persons and of deceased relatives, to explain the possibility to experience instantaneously and simultaneously (non-locality) a review and a preview of someone’s life in a dimensionwithout our conventional body-linked concept of time and space, where all past, present and future events exist, and the possibility to have clear consciousness with memories from early childhood, with self-identity, with cognition, and with emotion, and the possibility of perception out and above one’s lifeless body. We should conclude, like many others, that quantum mechanical processes could have something critical to do with how consciousness and memories relate with the brain and the body during normal daily activities as well as during brain death or clinical death. I would like now to discuss some aspects of quantum physics, because this seems necessary to understand my concept of the continuity of consciousness. Quantum physics has completely overturned the existing view of our material, manifest world, the so-called real-space. It tells us that particles can propagate like waves, and so can be described by a quantum mechanical wave function. It can be proven that light in some experiments behaves like particles (photons), and in other experiments it behaves like waves, and both experiments are true. So waves and particles are complementary aspects of light (Bohr).38 The experiment of Aspect, based on Bell’s theorem, has established non-locality in quantum mechanics (non-local interconnectedness).39 Non-locality happens because all events are interrelated and influence each other. Phase-space is an invisible, non-local, higher-dimensional space consisting of fields ofprobability, where every past and future event is available as a possibility.Within this phase-space no matter is present, everything belongs to uncertainty, and neither measurements nor observations are possible by physicists.40 The act of observation instantly changes a probability into an actuality by collapse of the wave function. Roger Penrose calls this resolution of multiple possibilities into one definitive state “objective reduction”.35 So it seems that no observation is possible without fundamentally changing the observed subject; only subjectivity remains. The phase-speed in this invisible and non-measurable phase-space varies from the speed of light to infinity, while the speed of particles in our manifest physical real-space varies from zero to the speed of light. At the speed of light, the speed of a particle and the speed of the wave are identical. But the slower the particle, the faster the wave-speed, and when the particle stops, the wave-speed is infinite. The phase-space generates events that can be located in our space-time continuum, the manifest world, or real-space. Everything visible emanates form the invisible. Quantum physics cannot explain the essence of consciousness or the secret of life, but in my concept it is helpful for understanding the transition between the fields of consciousness in the phase-space (to be compared with the probability fields as we know from quantum mechanics) and the body-linked waking consciousness in the real-space, because these are the two complementary aspects of consciousness.41 Our whole and undivided consciousness with declarative memories finds its origin in, and is stored in this phase-space, and the cortex only serves as a relay station for parts of our consciousness and parts of our memories to be received into our waking consciousness. In this concept consciousness is not physically rooted. This could be compared with the internet, which does not originate from the computer itself, but is only received by it. Life createsthe transition from phase-space into our manifest real-space; according to our hypothesis life creates the possibility to receive the fields of consciousness (waves) into the waking consciousness which belongs to our physical body (particles). During life, our consciousness has an aspect of waves as well asofparticles, and there is a permanent interaction between these two aspects of consciousness. This concept is a complementary theory, like both the wave and particle aspects of light, and not a dualistic theory. Subjective (conscious) experiences and the corresponding objective physical properties are two fundamentally different manifestations of one and the same underlying deeper reality; they cannot be reduced to each other.30 The particle aspect, the physical aspect of consciousness in the material world, originates from the wave aspect of our consciousness from the phase-space by collapse of the wave function into particles (“objective reduction”), and can be measured by means of EEG, MEG, MRI, and PET scan. And different neuronal networks function as interface for different aspects of our consciousness, as can be demonstrated by changing images during these registrations of EEG, MRI or PET scan. The wave aspect of our indestructible consciousness in phase-space, with non-local interconnectedness, is inherently not measurable by physical means. When we die, our consciousness will no longer have an aspect of particles, but only an eternal aspect of waves. How should we understand the interaction between our consciousness and ourfunctioning brain in our continuously changing body? As stated before, during our life the composition of our body changes continuously, as during each second 500000 cells are being replaced in our body. What could be the basis of the continuity of our changing body? Cells and molecules are just the building blocks. In assessing all the theories mentioned above, it seems reasonable to consider the person-specific DNA in our cells as the place of resonance, or the interface across which a constant informational exchange takes place between our personal material body and the phase-space, where all fields of our personal consciousness are available as fields of possibility. DNA is a molecule, composed of nucleotides, with a double helix structure. In humans it is organized into 23 pairs of chromosomes, defines 30,000 genes, and contains about 3 billion base pairs.45 About 95% of human DNA has a still unknown function, for which reason it is called “junk DNA,” non-protein-coding DNA, or introns,46 and the 5% protein-coding called exons. The more complex a species is, the more introns it has. Simon Berkovich assumes that this “junk DNA” could have an identifying purpose, comparable to a kind of “barcode” functionality. According to his hypothesis DNA itself does not contain the hereditary material, but is capable of receiving hereditary information and memories from the past, as well as the morphogenetic information, which contains the way the body will be built with all its different cell systems with specialized functions.47 Person-specific DNA is in this model the receiver as well as the transmitter of our permanently evolving personal consciousness. Following a heart transplant, the donor heart contains DNA material foreign to the recipient. In a few recent books it has been reported that sometimes the recipient experiences thoughts and feelings that are totally strange and new, and later it becomes obvious that they fit with the character and consciousness of the deceased donor.50,51 The DNA in the donor heart seems to give rise to fields of consciousness that are received by the organ recipient. Unfortunately, until now scientific research on this has not been possible due to the reluctance of the transplant centers. In trying to understand this concept of quantum mechanical mutual interaction between the invisible phase-space and our visible, material body, it seems appropriate to compare it with modern worldwide communication. There is a continuous exchange of objective information by means of electromagnetic fields for radio, TV, mobile telephone, or laptop computer. We are unaware of the vast amounts of electromagnetic fields that constantly, day and night, exist around us and through us, as well as through structures like walls and buildings. We only become aware of these electromagnetic informational fields at the moment we use our mobile telephone or by switching on our radio, TV or laptop. What we receive is not inside the instrument, nor in the components, but thanks to the receiver, the information from the electromagnetic fields becomes observable to our senses and hence perception occurs in our consciousness. The voice we hear over our telephone is not inside the telephone. The concert we hear over our radio is transmitted to our radio. The images and music we hear and see on TV are transmitted to our TV set. The internet is not located inside our laptop. We can receive what is transmitted with the speed of light from a distance of some hundreds or thousands of miles. And if we switch off the TV set, the reception disappears, but the transmission continues. The information transmitted remains present within the electromagnetic fields. The connection has been interrupted, but it has not vanished and can still be received elsewhere by using another TV set (“non-locality”). Could our brain be compared to the TV set, which receives electromagnetic waves and transforms them into image and sound, as well as to the TV camera, which transforms image and sound into electromagnetic waves? This electromagnetic radiation holds the essence of all information, but is only perceivable by our senses through suitable instruments like camera and TV set. The informational fields of our consciousness and of our memories, both evolving during our lifetime by our experiences and by the informational input from our sense organs, are present around us,and become available to our waking consciousness only through our functioning brain (and other cells of our body) in the shape of electromagnetic fields. As soon as the function of the brain has been lost, as in clinical death or brain death, memories and consciousness do still exist, but the receptivity is lost, the connection is interrupted. According to our concept, grounded on the reported aspects of consciousness experienced during cardiac arrest, we can conclude that our consciousness could be based on fields of information, consisting of waves, and that it originates in the phase-space. During cardiac arrest, the functioning of the brain and of other cells in our body stops because of anoxia. The electromagnetic fields of our neurons and other cells disappear, and the possibility of resonance, the interface between consciousness and physical body, is interrupted. Such understanding fundamentally changes one’s opinion about death, because of the almost unavoidable conclusion that at the time of physical death consciousness will continue to be experienced in another dimension, in an invisible and immaterial world, the phase-space, in which all past, present and future is enclosed. Research on NDE cannot give us the irrefutable scientific proof of this conclusion, because people with an NDE did not quite die, but they all were very, very close to death, without a functioning brain. The conclusion that consciousness can be experienced independently of brain function might well induce a huge change in the scientific paradigm in western medicine, and could have practical implications in actual medical and ethical problems such as the care for comatose or dying patients, euthanasia, abortion, and the removal of organs for transplantation from somebody in the dying process with a beating heart in a warm body but a diagnosis of brain death. There are still more questions than answers, but, based on the aforementioned theoretical aspects of the obviously experienced continuity of our consciousness, we finally should consider the possibility that death, like birth, may well be a mere passing from one state of consciousness to another. Van Lommel W, Van Wees R, Meyers V, Elfferich I. Near-death experience in survivors of cardiac arrest: a prospective study in the Netherlands. Lancet 2001;358:2039-2045. Greyson B. Incidence and correlates of near-death experiences in a cardiac care unit. Gen Hosp Psychiatry 2003;25:269-276. Parnia S, Waller DG, Yeates R, Fenwick P. A qualitative and quantitative study of the incidence, features and aetiology of near death experiences in cardiac arrest survivors. Resuscitation 2001;48:149-156. Ritchie G.G. Return from Tomorrow. Grand Rapids, Michigan: Chosen Books of The Zondervan Corp., 1978. Blackmore S. Dying to Live: Science and the Near-Death Experience. London: Grafton -- An imprint of Harper Collins Publishers, 1993. Appelby L. Near-death experience: analogous to other stress induced physiological phenomena. BMJ 1989;298:976-977. Owens JE, Cook EW, Stevenson I. Features of "near-death experience" in relation to whether or not patients were near death. Lancet 1990;336:1175-1177. Penfield W. The Excitable Cortex in Conscious Man. Liverpool: Liverpool University Press, 1958. Meduna LT. Carbon Dioxide Therapy: A Neuropsychological Treatment of Nervous Disorders. Springfield: Charles C. Thomas, 1950. Whinnery JE, Whinnery AM. Acceleration-induced loss of consciousness. Arch Neurol 1990;47:764-776. Lempert T, Bauer M, Schmidt D. Syncope and Near-Death Experience. Lancet 1994;344:829-830. Jansen K. Neuroscience, Ketamine and the Near-Death Experience: The Role of Glutamate and the NMDA-Receptor, In: The Near-Death Experience: A Reader. Bailey LW, Yates J, eds. New York and London: Routledge, 1996:265-282. Grof S, Halifax J. The Human Encounter with Death. New York: Dutton, 1977. Schröter-Kunhardt M. Nah--Todeserfahrungen aus Psychiatrisch-Neurologischer Sicht. In: Knoblaub H, Soeffner HG, eds. Todesnähe:Interdisziplinäre Zugänge zu Einem Außergewöhnlichen Phänomen. Konstanz: Universitätsverlag Konstanz, 1999:65-99. Sabom MB. Light and Death: One Doctor’s Fascinating Account of Near-Death Experiences: “The Case of Pam Reynolds.” In chapter 3: Death: The Final Frontier. Michigan: Zondervan Publishing House, 1998:37-52. Ring K, Cooper S. Mindsight: Near-Death and Out-Of-Body Experiences in the Blind. Palo Alto: William James Center for Consciousness Studies, 1999. Gopalan KT, Lee J, Ikeda S, Burch CM. Cerebral blood flow velocity during repeatedly induced ventricular fibrillation. J Clin Anesth 1999;11(4):290-295. De Vries JW, Bakker PFA, Visser GH, Diephuis JC, A.C. Van Huffelen AC. Changes in cerebral oxygen uptake and cerebral electrical activity during defibrillation threshold testing. Anesth Analg 1998;87:16-20. Clute H, Levy WJ. Electroencephalographic changes during brief cardiac arrest in humans. Anesthesiology 1990;73:821-825. Losasso TJ, Muzzi DA, Meyer FB, Sharbrough FW. Electroencephalographic monitoring of cerebral function during asystole and successful cardiopulmonary resuscitation. Anesth Analg 1992;75:12-19. Parnia S, Fenwick P. Near-death experiences in cardiac arrest: visions of a dying brain or visions of a nes science of consciousness. Review article. Resuscitation 2002;52:5-11. Smith DS, Levy W, Maris M, Chance B. Reperfusion hyperoxia in the brain after circulatory arrest in humans. Anesthesiology 1990;73:12-19. Desmedt JE, Robertson D. Differential enhancement of early and late components of the cerebral somatosensory evoked potentials during forced-paced cognitive tasks in man. J Physiol 1977;271:761-782. Roland PE, Friberg L. Localization in cortical areas activated by thinking. J Neurophysiol 1985;53:1219-1243. Eccles JC. The effect of silent thinking on the cerebral cortex. Truth Journal, International Interdisciplinary Journal of Christian Thought 1988:Vol 2. Roland PE. Somatotopical tuning of postcentral gyrus during focal attention in man. A regional cerebral blood flow study. J Neurophysiol 1981;46:744-754. Libet B. Subjective antedating of a sensory experience and mind-brain theories: Reply to Honderich (1984). J Theor Biol 1985;144:563-570. Bierman DJ, Radin DI. Anomalous anticipatory response on randomised future conditions. Percept Mot Skills 1997;84:689-690. Bierman DJ, Scholte HS. A fMRI brain imaging study of presentiment. Journal of ISLIS 2002;20(2):280-288. Romijn H. About the origin of consciousness. A new, multidisciplinary perspective on the relationship between brain and mind. Proc Kon Ned Akad v Wetensch 1977;100(1-2):181-267. Romijn H. Are Virtual Photons the Elementary Carriers of Consciousness? Journal of Consciousness Studies 2002;9:61-81. Hallett M. Transcranial magnetic stimulation and the human brain. Nature 2000;406:147-150. Penfield W. The Mystery of the Mind. Princeton: Princeton University Press, 1975. Blanke O, Ortigue S, Landis T, Seeck M. Stimulating illusory own-body perceptions. The part of the brain that can induce out-of-body experiences has been located. Nature 2002;419:269-270. Penrose R. Shadows of the mind. Oxford: Oxford University Press, 1996. Berkovich SY. On the information processing capabilities of the brain: shifting the paradigm. Nanobiology 1993;2:99-107. Bohr N, Kalckar J, editors. Collected Works. Volume 6: Foundations of Quantum Physics I (1926-1932). Amsterdam, New York: North Holland, 1997:91-94. Aspect A, Dalibard J, Roger G. Experimental tests of Bell’s inequality using varying analyses. Phys Rev Lett 1982;25:1084. Heisenberg W. Schritte über Grenze. Munchen: R. Piper & Co Verlag, 1971. Walach H, Hartmann R. Complementarity is a useful concept for consciousness studies. A Reminder. Neuroendrocrinol Lett 2000;21:221-232. Hameroff S, Penrose R. Orchestrated reduction of quantum coherence in brain microtubules. In: Proceedings of the international neural Network Society, Washington DC, Erlbaum, Hillsdale, NJ, 1995. 43. Thaheld F. Biological non-locality and the mind-brain interaction problem: comments on a new empirical approach. Biosystems 2003;2209:1-7. Wackermann J, Seiter C, Keibel H, Walach H. Correlations between electrical activities of two spatially separated human subjects. Neurosci Lett 2003;336:60-64. Ridley M. Genome. The autobiography of a species in 23 chapters. New York: Harper Collins Publishers, 2000. Mantegna RN, et al. Linguistic features of non-coding DNA sequences. Phys Rev Lett 1994;73:31-69. Berkovich SY. On the ”Barcode” Functionality of the DNA, or the Phenomenon of Life in the Physical Universe. Pittsburgh: Dorrance Publishing CO, 2003). Schrödinger E. What is Life? Cambridge: Cambridge University Press, 1944. Hameroff S. Quantum computing in DNA. http://www.consciousness.arizona.edu/hameroff/New/ Quantum_computing_in_DNA/index.htm. Sylvia C, Novak W. Change of Heart. New York: Little, Brown, 1997. 51.Pearsall P. The Heart’s Code. New York: Broadway Books, Bantam Doubleday Dell, Inc, 1998.